Figure 7 shows the intensification rate for each upper-tier municipality in the region for the 10-year period from 1991 to 2001. The municipalities are ordered according to their geographic position from west to east, starting with regional and single-tier municipalities within the Greater Toronto Area and Hamilton (also referred to as the Inner Ring of the GGH) to the left of the vertical dashed line, and followed by upper-tier municipalities in the outlying areas (also referred to as the Outer Ring of the GGH), beginning with Niagara Region. The horizontal dashed line indicates the 40% target. The actual numbers used to calculate this table are contained in Appendix C.
Note that on this graph, the difference between the intensification rate and the figure of 100% is greenfield development. Therefore, in Hamilton, for example, which has a rate of just under 25%, all other residential development in the study period (75%) occurred on greenfield land. Figure 8 presents the same information as the table in Appendix C, but in map form. The size of the pie chart superimposed on each upper-tier municipality represents the total amount of development in the 10-year period. For example, the largest circle is York Region's, which represents just over 73,000 units for the time period. The pink part of the circle represents the amount of development in the form of intensification; in York region's case, the pink slice represents just under 23,000 units of intensification. The dashed line indicates the 40% target, indicating how close or how far a municipality's rate is from the target. The map shows that not only is new development unevenly distributed throughout the region, but so too is intensification. In addition, this map illustrates two major findings. 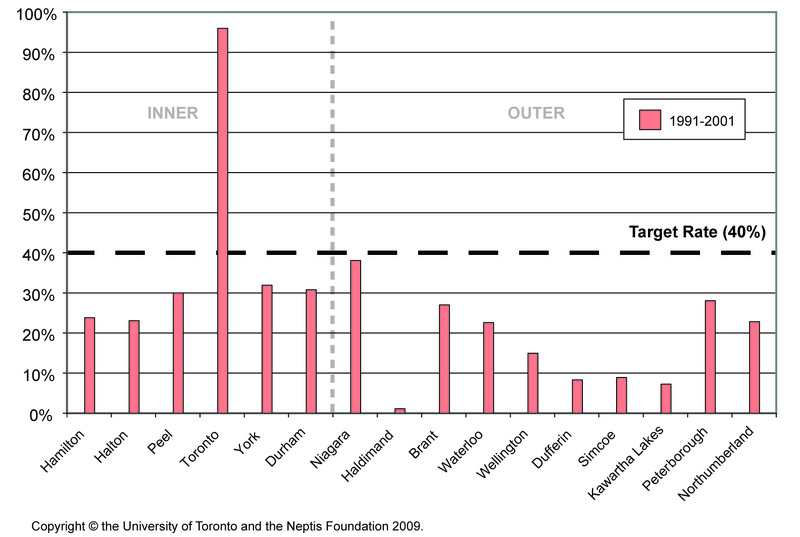 First, intensification rates vary widely across the region outside Toronto (where nearly all development is in the form of intensification), from as high as 33% in Niagara to as low as 1% in Haldimand County. Second, a municipality can have a high rate of intensification but contribute relatively few units of intensification--or vice versa. For example, Peterborough has an intensification rate of 27%, but contributed only about 1,400 new units over the 10-year period, whereas Simcoe County's very low intensification rate of 8% yielded about 2,400 units of intensification, given the rapid rate of development in the county. 15. M. Burchfield, B. Moldofsky, and J. Ashley, A method for estimating historical rates of residential intensification using RS imagery and Census data. Technical paper No. 2. (Toronto: University of Toronto Office of Cartography, December 2007).http://www.geog.utoronto.ca/research/research-publications/gcut.